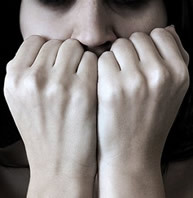 Anxiety Disorders research papers discuss the types of psychological disorders characterized by fear and apprehension. Psychology research paper topics often have some relationship to anxiety disorders. There are many types of anxiety disorders and Paper Masters has writers that can help write you a research paper on any or all of them. People with general anxiety disorders may be unable to remain still for long periods of time and may engage in fidgeting behaviors such as crossing and uncrossing their legs or arms or playing nervously with their hair or clothing. An unexpected sound, such as a honking horn or the ringing of a telephone causes unexplained anxiety, rapid heartbeat, or quickened breathing. According to the Anxiety and Depression Society, 0ther anxiety disorders are characterized by different symptoms. For example, individuals with panic disorder experience a sudden onset of intense terror, and may suffer from an impending feeling of doom. Individuals who suffer from this disorder may experience severe chest pains, dizziness, shortness of breath, trembling and sweating. Some experts contend that biological factors may play a role in panic disorders. Individuals with a phobic disorder have an unexplainable, irrational, overwhelming, and persistent fear of a particular object or situation. Individuals with phobia disorders will go to almost any lengths to avoid the thing that scares them. Individuals with Obsessive-Compulsive disorders have thoughts that will not go away or feel they must perform behaviors over and over again. People with obsessive personalities may refuse to leave their homes because of persistent thoughts that they will kill someone and compulsive personalities may wash their hands a hundred times a day in order to get rid of germs. Unlike the other anxiety disorders, post-traumatic stress disorder is caused by exposure to a traumatic event such as a natural disaster, repeated child abuse, c, and mass casualty accidents. Paper Masters writes custom research papers on Anxiety Disorders and discuss the types of psychological disorders characterized by fear and apprehension.